All that we cannot say belongs to a series of works in which minimal lighting sources enter into a chamber-music-like relationship with delicate, multiphonic, instrumental sounds. All that we cannot say is an instrumental-theatre piece, and can also be performed within a concert context, provided the performance area and auditorium can be held completely dark. The duration, pacing and expression of the piece varies considerably from performance to performance. The instrumental musicians play from horizontally-adjusted music-stands, with their music illuminated by assistant musicians using matches. The whole piece is situated in a register of extreme fragility, ever vulnerable to the possibility of uncertain pauses. Although the matches control the temporal development of the piece, their use is so hard to control musically that musicians and audience alike become sensitive to the life of each match – its sound, the energy curve of its being lit and dying away, the quality of the light it sheds as it flickers and burns. 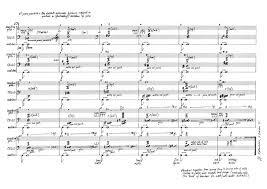 All that we cannot say was written for Hitzacker Musiktage 2002, and first performed there by Ensemble Recherche. Am stärksten berührte und forderte die Engländerin Juliana Hodkinson heraus. Sie hatte die Zwiesprache zwischen Oboe und Violoncello in dreissig benutsam aufsteigende Klangfelder aufgeteilt und deres jeweilige Dauer durch den Schein brennender Streichhölzer bestimmt. Dieses Duo aus dem Dunkel sondierte als Performance das Feld zwischen Zufall und Strenge. Es scharfte die Ohren. Strenge herrscht in "All that we cannot say" von Juliana Hodkinson. Oboe und Cello erzeugen Spaltklänge, die Pulte der Musiker werden mit Zündhölzern beleuchtet. Die Obertöne der Instrumente verflüchtigen sich ebenso eigensinnig wie die kleinen Flammen, müssen immer wieder neu hervorgerufen werden. Die Sparsamkeit der Eindrücke nimmt den Hörer gefangen.